In February of this year, the Bureau of Land Management (BLM) in Utah rounded up and removed 103 wild horses from the Sulphur Herd Management Area (HMA) in Utah. Among those captured, was a 26-year-old grulla stallion whose plight captured the attention of the public. Over 24,000 Americans signed a petition calling on the BLM to release this proud stallion, who spent over two decades in the wild, back to the range to live out the only life he had ever known -- one of freedom. BLM ignored the request, and proceeded with an Internet auction of this stallion and his herd on April 21, 2015. 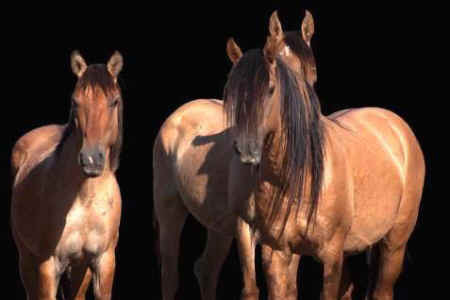 Wild horse advocate Jacquelyn Hieber reached out to Black Hills Wild Horse Sanctuary who agreed if she were able to win bids on a few Sulphur stallions including the senior now known as #3907, they could provide a forever sanctuary for these horses. After the original person who was the high bidder for the senior Sulphur stallion rescinded her bid, Jacquelyn was able to claim him. He and eight other mustangs from the Sulphur roundup would be heading to Black Hills Wild Horse Sanctuary. Tragically, just a few weeks before he was scheduled to make the trek to sanctuary, #3907persished on July 28, 2015 at the BLM holding corrals while being gelded. AWHPC supporters generously contributed funds to underwrite the transport costs and endowment for the grulla stallion and his closest friend. While the beautiful elder stallion who captured the hearts of many did not make it to sanctuary, the funds raised were donated in his memory to help care for his herd mates who did make it to sanctuary. Return to Freedom Wild Horse Sanctuary , AWHPC's parent organization, was able to take in two stunning senior stallions from the Sulphur HMA, aged 20 and 15. All of the Sulphur Mustangs that have come to the Black Hills Wild Horse Sanctuary Mother’s Day weekend 2015 were from the Sulphur Springs HMA. They are reunited now in one large corral with two separate areas in case they need space. I see the foals running and playing and since they were born in captivity they escaped the horrors of the BLM roundup. The foals were the first of the Sulphur herd to integrate and visit all the other Sulphurs as they come in. There is a run-in shed that they have decided they like to get into to get out of the sun. Imagine wild horses wanting to be in a shed! Just a few months ago they were wild living in the mountains of Utah. Their lives and family bands were shattered by the BLM roundup; but now these mustangs have a second chance to be happy again. Thank you AWHPC donors for your contributions to the BLM Sulphur Mustangs coming to the Black Hills Wild Horse Sanctuary. Part of the funds will be used at the end of the month to bring one more Sulphur mare and 4 foals into the Sanctuary.